Hard drives crash. It is a fact of life. A lot of times they take priceless photos, videos, and other files with them. If you have ever lost any of these things due to a hard drive crash, you know how important it is to back up your files. MyPCBackup is not only an automatic online backup program, it also provides the user with the ability to access their data anywhere using cloud technology. MyPCBackup is a terrific online data backup resource because it backs up your important files to a secure location. Though they are fairly new having started in February 2010, they have their own backup software. MyPCBackup is located in the United Kingdom, and they use Amazon S3 servers for storing client data. MyPCBackup offers incremental, selective, and automatic backup options. The selective option allows users to choose specific files and folders you would like to have backed up. Another great feature is that backups restart automatically if they are interrupted due to a power outage, an interruption in internet connection, or any other reason. Data can be backed up on an hourly, daily, weekly, or monthly schedule. The schedule feature provides a wide variety of programming options. I went with backing up the data hourly because I do not care to ever lose even an hour’s worth of work. When choosing a time increment, if you choose to go that route, a good rule of thumb is to ask yourself how many hours of work you are willing to lose. If a backup error occurs, MyPCBackup lets you know. It also notifies you once the backup is done. In the client area of the site, MyPCBackup provides a log of all the backups that have taken place. As part of its cloud services, MyPCBackup allows users to sync up files and folders across several computers. This is especially nice for people who like to bring their work home with them from the office. You can access your files and data anywhere on any device using MyPCBackup’s remote features. If you happen to be somewhere that does not have an internet connection, you can still work on files. And, when you have an internet connection again, it will automatically back up your work. One of the more amazing features of MyPCBackup is that you can view your files, manage your folders, and access your data using a smartphone. The sync feature allows the syncing of all data to your smartphone. MyPCBackup offers this for all smartphones, including Androids, BlackBerrys, and iPhones. All of MyPCBackup’s servers are secure and encrypted thus providing data with top security. The type of encryption is similar to what banks use for online banking, so you can be sure it is top of the line. MyPCBackup takes extra precautions to make sure no data is lost by saving files to the online servers, a folder on your computer, and to your online account. 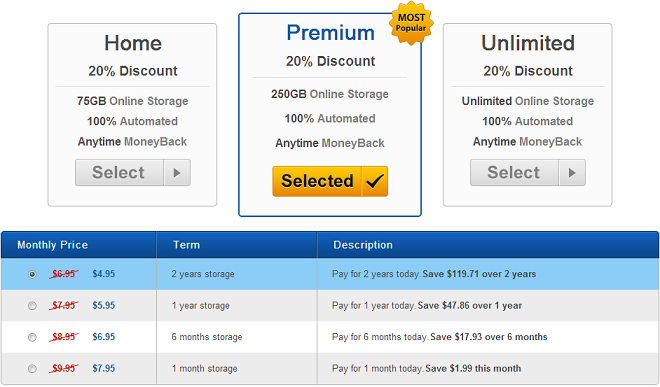 When picking a backup storage provider, it is important to find out how much data you can store. You want all of your data to be backed up. MyPCBackup does not put a limit on the file size of documents you back up. This means you can back up photos, videos, and all sorts of documents without fear of running out of space. During backup, MyPCBackup starts with the smallest files and works its way to the largest. There are no restrictions on which file types you can back up. This includes movies and music. Your USB and external hard drives can also get backed up on MyPCBackup. This is highly encouraged, so you do not lose any data. The interface for the online data backup service is quite easy to use. Your account has a main dashboard. You use this to navigate to where you want to go. From here, you can view the space you have used, previous backup information history, number of synced computers, and all of your backed up files. This is also where you can view your event log giving details of your past backups. 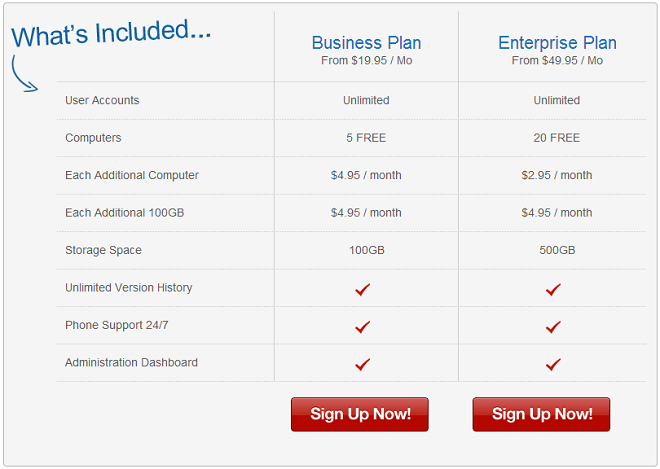 MyPCBackup offers a variety of plans. For individuals, there are four different plans that vary in price based on level of commitment. For one month, it costs $9.95. Six months is $41.70. One year is $71.40. And, the two year plan costs $118.80, which is 50 percent less than if you were to purchase the service month-by-month. In addition to their services to individuals, MyPCBackup also provides solutions for businesses. There are two business plans: the Business Plan and the Enterprise Plan. The Business Plan costs $19.95 per month, but this can vary based on commitment level and any add-ons. This plan includes seven days per week, 24 hours a day phone support, unlimited accounts, administration dashboard, and unlimited version history. The Business Plan starts out with 100 GB of storage space, but if any more storage is needed, it is easy to upgrade for $4.95 per month for each additional 100 GB of space. Also, you can use the plan on five different computers and each additional computer costs $4.95. If you run a larger business, the Enterprise Plan is probably your best option. This plan costs $49.95 (but may be less with a longer commitment) and builds upon the Business Plan. You are given a base 500 GB of storage space, but this can be expanded for $4.95 per month for each additional 100 GB of space. Also, you can use MyPCBackup on 20 of your computers and can add computers for an additional $2.95 per month. Look out for the secret link on the MyPCBackup website to get 35% off on your purchase price. MyPCBackup has one of the most extensive lists of features on the market. Unfortunately, one of the features they are missing that I personally could use is a photo organizer for managing images more easily. I also was not able to back up files that I was currently using. All files must be closed and saved before they are backed up. This is fairly standard among storage services though. If you are listening, backup services, this could be the idea to tackle if you would like to corner the market. Another minor feature I would have liked to have seen is the ability to set permissions on what different users can see when shared from mobile devices. I did a search of discussion forums devoted to online backup services to see if there were any common complaints about MyPCBackup. There were only a couple minor gripes. Some users had trouble figuring out how to use the interface. 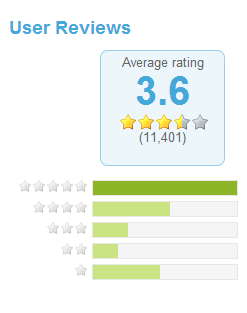 These users did not appear to have any experience performing backups. Their problems were solved after they watched the relevant tutorial from the extensive library of video tutorials MyPCBackup supplies. In my opinion, customer service can make or break a company. Many online backup services only provide email support or a support ticket system. 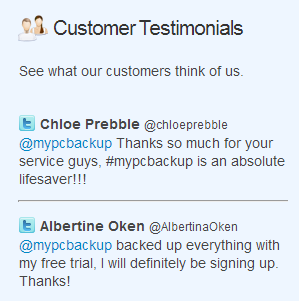 MyPCBackup is one of the few that actually publicizes its phone number for customers to get help quickly. MyPCBackup has email assistance, and there is also a help desk support ticket system. Their website also provides multiple resources for extra assistance. A wide variety of categories and topics are available in an extensive knowledgebase to answer any questions you may have. The FAQ section is also quite extensive and answers questions on backups, billing, restoring files, and security. The step-by-step tutorials on the website are also quite useful. There are video tutorials for backing up your files, syncing files, and going through the installation process. MyPCBackup is a company designed to impress. Though they have been around for just under four years, they have put together an exceptional product. The software was clearly created with the end user’s comfort in mind. Their tutorials are easy to follow, and if you have issues, there are customer service representatives ready to help. And, from first signing up to backing up files, it only took ten minutes. 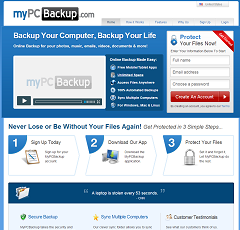 If you are looking for an excellent online backup service, MyPCBackup is the way to go. The selection of backup features is vast. The ability to choose between incremental, selective, and automatic backups is crucial. The interface is easy to use and intuitive. And, having the option to backup files on the hour is something I especially liked. It can be risky offering mobile services for security reasons, but MyPCBackup does a great job of ensuring encrypted and secure connections. I enjoyed that I was able to use the program on my smartphone without a hitch. Nothing about MyPCBackup made me feel for even a moment that my files may not be safe.